What we put underneath a roof is just as important at Vincent Enterprise as what we put on your roof. For example, each roof is properly insulated with R18 efficiency insulation. We use leading brand ice and water membrane sheeting and ensure your attic is properly vented so that back-sweat, condensation are avoided and proper air quality is maintained. Through the process of taking though-out steps on your roof project things like heat loss prevention are achieved and in the end it benefits your pocket book! 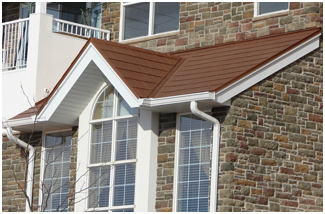 In addition to our steel roofing products, our installers can install seamless eavestroughing in a wide variety of colours – to match your roofing or to compliment your exterior décor. When considering installing eavestroughing, also consider maintenance reducing Gutter Covers – which limit debris buildup and assist in protecting your currently installed roof from water and ice damage. Vincent Enterprise can also recommend and install the Heat-Line freeze prevention products – all Canadian made from Haliburton, Ontario, as a further barrier to ice and freezing type damage. Ice-Brakes hold snow in place at the roof surface. Snow and ice slide against the surface of the roof not above it. We can also install snow bars and snow locks. The MaxiVent is designed specifically to meet the unique requirements of Cathedral ceilings. It spans the entire width of the rafters ensuring that condensation will not be caused by water vapor laden fiberglass contacting the roof sheathing during cold weather. Additionally, because of its rigid laminated construction it is strong enough to retain its shape it will not be crushed like flimsy alternatives. 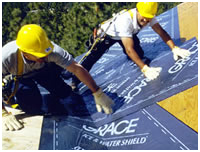 Grace Ice & Water Shield offers premium leak protection for sloped roofs in climates subject to ice dams and wind-driven rain. It is applied to the roof deck prior to the application of the finished roof covering, which is most often shingles but can also be tile or metal. The membrane goes under shingles and seals around nails that hold the shingles in place, so water that doesn't drain properly cannot penetrate the roof. It also creates a weather-tight barrier against wind-driven rains that cause shingles to lift and leak. To learn more about the exterior finishing including soffit, fascia and eavestrough please visit our Exterior Finishing area. Contact Vincent Enterprise to discuss and questions you may have about your roofing requirements.